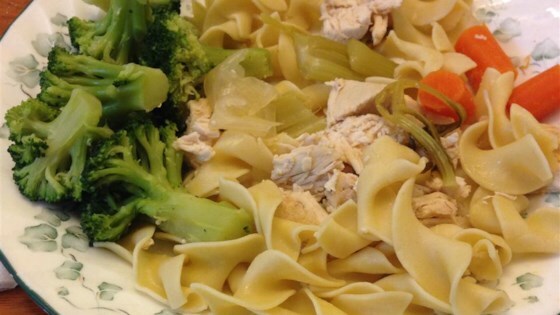 "Poached chicken has much more flavor and a better taste than boiled chicken. If you want to eat more lean protein, give this recipe a try. I like to eat the veggies!" Combine chicken stock, water, yellow onion, celery, carrots, tomato paste, salt, peppercorns, and bay leaf in a large pot; bring to a gentle simmer. Decrease heat to medium-low and simmer, checking the flavor occasionally, until vegetables are slightly tender, 30 to 45 minutes. Bring stock to a boil and add chicken, pouring in more water if chicken isn't completely covered in liquid. Bring poaching liquid to a boil; remove pot from heat and cover tightly with a lid until chicken is no longer pink in the center, about 15 minutes. An instant-read thermometer inserted into the center should read at least 165 degrees F (74 degrees C). Chef John's special cut of chicken can be prepped ahead of time. Allow chicken to come to room temperature while preparing the stock. I leave my onion whole, but cut slits into it to help release the flavor. The poaching liquid could be reused when the chicken is used. For example, if you were making chicken tacos. The chicken can then be removed from the poaching liquid to come down to room temperature and then refrigerated until needed. The nutrition data for this recipe includes the full amount of the stock ingredients. The actual amount of the stock consumed will vary. The chicken breasts come out so moist, tender and flavorful. I cube them and freeze for a quick and delicious lunch or dinner. I did this with just one chicken breast, and it worked beautifully. The result was two pieces of a moist chicken breast that had a nice flavor. Simple and easy! Followed the recipe exactly and it was delicious. Will definitely make again. This is a terrific method for preparing chicken. It's juicy, flavorful, and versatile. Thank you for a great recipe!